It is usually sad to hear cases like deleted photos from mobile phones without having any backups. People are often frustrated in learning that there are no other ways but to leave it like that. However, we would like to set the difference. Google Photos Backup Slow? Here are The Solutions! First, you have to understand how the program will do the recovery. As we all know, galleries are often stored in the internal or external phone memory of the device. When we delete a photo, for example, the data is still stored inside the device but is just hidden unless it will be replaced or overwritten. All the deleted pictures stay inside the device until you take a new picture and it will overwrite the space of the deleted content. Which means that when you have discovered that the photos are gone, stop doing any activities on the device until recovery is completed. Today, we will tell you how to recover deleted photos from Android Gallery. Quick Solution: How to Recover Deleted Photos from Android Gallery? Step 1. Launch FoneDog Toolkit- Android Data Recovery on the computer and Plug in the Android phone. First, you need to download and install the program FoneDog Toolkit- Android Data Recovery and then launch the software and connect the Android phone using a USB cable. Wait until the software automatically detects the connection. 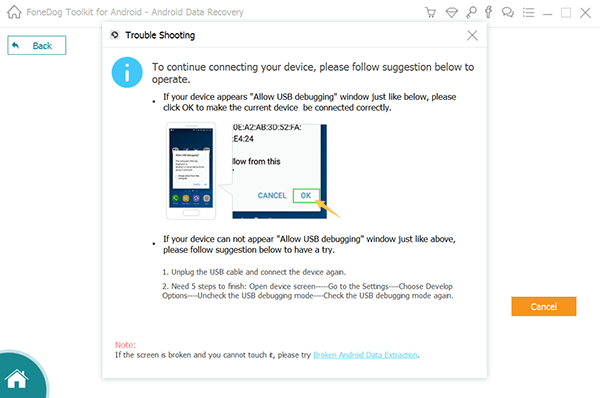 If this is the first time you have connected the mobile to the computer then you might need to install certain required drivers before you begin the recovery. You may follow the prompts on how to do it in case. Step 2. Enable the USB debugging on Android. The next step is to enable the USB debugging on the Android phone by referring to your device’s software version. The USB debugging only performs a stable connection between the two devices (Computer and Android phone). Tap OK on the computer screen to continue to the next step. Step 3. Choose Gallery Files Types to Recover on Android. On the next screen, you will be prompted to select the files you want to scan and recover. Find the gallery under the Media category and mark all the desired files. Click ‘Next’ to continue. Step 4. Scan, Preview, and Recover Gallery. The entire scanning will take a while depending on the total amount of data being recovered by FoneDog Toolkit- Android Data Recovery. It will display the scanning progress on the screen to keep your phone still connected and must have enough battery life to support. Once it stops, you can now see the display of all categories on the left side of the program screen while you can preview the recovered items on the right. You can filter the search by toggling on the ‘only display deleted item/s’. Mark those gallery items you needed for selective recovery or you can choose to select all of the recovered items and download them. Create a folder destination on your computer for all the recovered items and then click the “Recover” button at the bottom of the screen. Bonus #1: How to Backup Gallery Pictures to Google Account? Take advantage of your Android phone and use the Google account affiliated with the device. For future references, you can easily back up your gallery to Google and it will automatically store all the media contents of the Android device. In many cases of data loss, you can easily restore them from the Google Account. On the Android phone, launch the Google Photos app. At the top, tap Menu key. Choose Settings and then Back up & sync. Tap "Back up & sync" on or off. Remember you only get 15 GB of free Google storage. If you exceed the free space you can opt to upgrade or customize the upload size of the media contents. Bonus #2. How to Backup Gallery to Computer (Manual)? You may also backup the gallery manually to the computer to be really sure you still get hold of all your pictures. This is the traditional way of storing and saving your pictures in case you might delete them on the mobile phone. Now with all these backup options given, you will surely find it easy to recover deleted photos without any headaches. Sadly if you have not taken proper backup then you will find a hard time to recover them. The only option left to restore them now is to use third-party recovery programs that can scan and retrieve the photos for you. The only thing you have to consider now is to find the best recovery program that can really do the tough job for you. FoneDog Toolkit- Android Data Recovery is the world’s best Android recovery partner that is able to recover deleted photos from Android gallery of mobiles and tablets. You may also download third-party applications that offer backup to photos and other phone contents. However, you need to find the best and safe app that will take care of your personal data. Otherwise, you can use the options given above for worry-free backups. To recover deleted photos from Android gallery is just so simple and easy when you start using FoneDog Toolkit- Android Data Recovery. Apart from photos, you can recover other phone contents like contacts, call logs, messages, videos, and much more. There have been plenty of backup options that were offered by almost all Android brands in the market but only a few users take their time and follow these. The consequence of not having a backup is so painful especially when you realized you got nothing left behind. In this article, you will discover how photos are saved by default on the Android device and the many ways to get them back in case you lose them. And FoneDog Toolkit- Android Data Recovery has taken over the mobile world and has now become the Android’s best partner in data recovery. This is because this program has offered user-friendly software that can be used by anyone. You can download and use the Free Trial today and recover deleted photos on any Android device without having headaches! Tell your friends about it too.